At Georgetown University's Lombardi Comprehensive Cancer Center, researchers have announced the results of an important study showing that high levels of estrogen in the mother during pregnancy can increase a daughter's susceptibility to breast cancer later on. Specifically, the BRCA1 gene is disabled in an estrogen-rich environment, preventing it from carrying out its DNA repair tasks and leaving an opening for cancerous cells to grow. The research was presented at the 2013 American Association for Cancer Research (AACR) meeting by Dr. Leena Hilakivi-Clarke (right). 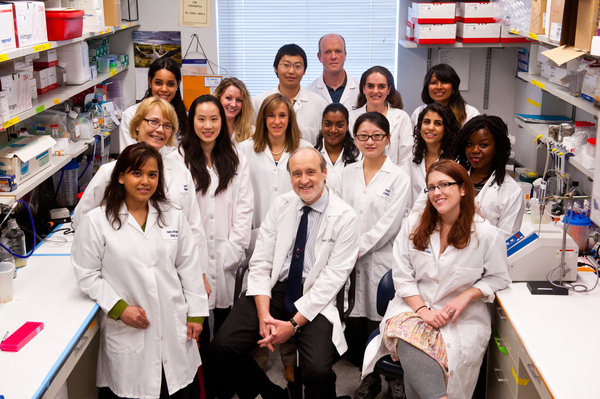 The Hilakivi-Clarke Lab is on the same floor of the Research Building as that of Dr. Robert Clarke, who collaborated on the study; the Clarkes both carry out hormone-related cancer research, and Robert Clarke is the Dean for Research at the Georgetown University Medical Center (GUMC). The BRCA1 gene is known as the cancer fighting gene, and a woman is more likely to develop breast cancer if the gene is compromised, either through mutation or silencing. In this study, Hilakivi-Clarke studied one-year-old girls who had been exposed to high levels of estrogen in utero. The BRCA1 gene was found to be silenced as a result of methylation and they were therefore at a higher risk for breast cancer as adults. Comparing the methylation profiles of these young girls to adult breast cancer profiles in the NIH's Cancer Genome Atlas, researchers recognized similar patterns of methylated genes. The significance of this finding is that breast cancer can not only be better predicted, but it can be treated earlier on. There are drugs that can reverse gene methylation damage. Additionally, the research turned up a related molecular abnormality in the unfolded protein response (UPR) pathway in the girls and women with methylated BRCA1. 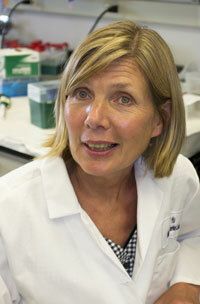 Problemmatic UPR pathway function is known to be linked to resistance to the cancer drug tamoxifen. If the methylation can be undone, and the UPR pathway normalized, the same women should respond more successfully to endocrine therapy drug treatment. Dr. Hilakivi-Clarke's broader research interests also include dietary components that effect hormone levels in pregnant women. Insofar as a highly estrogenic fetal environment is dangerous, keeping hormone levels in a safe range is one way to avoid increased breast cancer risk for daughters. In addition to her appointment as a Professor of Oncology at GUMC, Dr. Hilakivi-Clarke also is Co-Director of the Division of Molecular Endocrinology, Nutrition and Obesity. If BRCA1 sounds familiar, that may be because the patents that the University of Utah and Myriad Genetics hold on the gene and its cousin BRCA2 are at the center of a years-long legal challenge that is currently being held at the Supreme Court level. Arguments have been heard this week, beginning on Monday, and a ruling is expected by early this summer. This time the challenge to Myriad's patents (issued in the mid-90's) and its exclusive diagnostic test for breast cancer risk is being led by the Association for Molecular Pathology, with support from many physicians, researchers, and patients. Breast cancer research scientists have complained for years that research is hampered by the threat of legal action against them for studying the BRCA genes. Hospitals and physicians don't like being restricted to using Myriad's diagnostic test (which is expensive) when their own labs can test for the genes. Patients are angered at not being able to get a second opinion on the test results because no one else is allowed to run the tests but Myriad. The NIH wants access to all of the BRCA test results in their database for researchers to use, but currently that is up to the discretion of the company. The patents on BRCA1 and 2 are due to expire in 2014, and you can currently have your entire genome read for less than the cost of Myriad's tests, so the current Supreme Court decision is really about gene patenting more broadly. Do you have the right to own your own genes? Does anyone own genetic material, or is it a product of nature? Can Monsanto patent genetically modified seeds and then sue farmers when those seeds migrate into their fields? Without these patents will invention suffer because there is no profit to be made, or will science flourish in the absense of litigation? It might be noted that not only big pharma and agro-business concerns back Myriad in this test, but academic institutions that hold valuable gene patents (like the Univ of Utah, but also MIT and Harvard) are reluctant to see them nullified as well. For a previous blog of our referencing gene patenting, read: Genome Sequencing Research Moving at Warp Speed -- What to Expect. This news piece is brought to you by Biotechnology Calendar, Inc., a full-service science research marketing and events-planning company that hosts trade shows at top research universities nationwide. If you are a lab supplier or scientist looking to network with others in the science research field, consider attending one of our 2013 trade shows. Our 14th Annual Georgetown BioResearch Product Faire event will be held on the GUMC campus October 17, 2013.